Let me tell you a secret. Food doesn’t have to be really complicated to be really delicious. It’s important to have an arsenal of quick meals that you can put together in 30 minutes or less. They are a lifesaver on busy weeknights. My recipe for vegetable curry is perfect for those emergencies. I like to serve it over rice, but it’s also great on its own. In a wok, combine 2 cups of frozen vegetables, 1 can of crushed tomatoes, and half curry powder. Stir and cook over medium heat for 20 minutes, or until it has reduced to a thick liquid. Stir in the remaining curry powder, a little bit at a time, to suit your own taste. I’ve said it before and I will say it again. I have recently become obsessed with Indian food, and it’s not just because I’m trying to use the huge jar of curry powder I bought. Since so many Indian recipes are already vegetarian, it’s really easy to adapt them to be completely vegan. Plus, the spice and strong flavors are a nice break from my staple convenience foods like salads, veggie burgers and “quesadaiyas”. Tangent: I think it’s important for everyone to have a couple of go-to dishes that require little to no cooking and can be put together in a matter of minutes. It’s what keeps me from breaking down and running to the nearest drive-thru. However, any really healthy lifestyle does require commitment to the kitchen. It’s not easy to come up with new, nutritionally balanced meals every week. I feel like I dedicate a lot of time to researching and building recipes, and that’s before I even set foot in the kitchen. I just felt like I had to vent my semi-frustration with everyone out there, because I don’t want to come off as some sort of preacher. The next time that you are stressing out about meal planning, or feel like you spend too much time in the kitchen, just know that I have been there too. The bottom line, though, is that we spent a lot of time doing a lot of things: working, hanging out with friends, running errands, etc., and it’s just as important to spend time nourishing and strengthening our bodies. So, here’s a recipe that I came up with so you wouldn’t have to. I ran into some problems while cooking this dish, because the tofu stuck to the pan quite a bit. I had to add extra spray and I still managed to lose most of my “crust”. I just scraped it off the bottom of the pan and turned this into a semi-scramble. I suppose that my best bet would have been to add about a tablespoon of oil, but nobody likes a fat vegan, so I just dealt with it. Rinse, drain, and cube your tofu. Dredge it in cornstarch to help it crisp up a little on the outside. Heat a nonstick pan and spray it with a little cooking spray. Stir-fry the ginger with the chili powder for 2 minutes. Re-spray the pan and add the tofu. Cook over medium-high heat for 5 minutes. Add the remaining spices, peas, and crushed tomatoes. You may need to add about half a cup of water at this point, because you want the tomatoes to simmer. Cook for another 7-10 minutes or until most of the liquid has been absorbed and the peas are tender and warmed through. Continuing with my Indian themed recipes, I would like to present to you two side dishes that I served last week on Indian night. 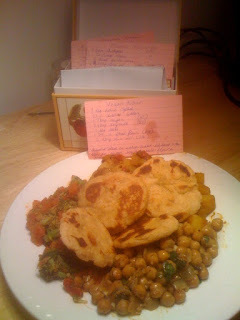 After planning out the chana masala and the batata nu shaak, I realized that my meal was lacking a vegetable side dish. I needed something easy, green, and spicy. I’m not sure if broccoli with tomatoes is an actual Indian side dish or not, but the tomatoes complimented the other ingredients really well and I used just enough chili powder to give it a little heat without being overwhelming. Just as I was about to start cooking, I realized that I needed chickpeas, so I had to make a Whole Foods run. It was there that I learned chickpeas are also known as garbanzo beans. See, I’m always telling people I know nothing about cooking. While at the store, I tried to pick up some naan. I love having naan to soak up all of the liquid that’s left behind on my plate. Also, I am a total wimp about spice, so it’s good for me to have something non-spicy to gnaw on. All of the naan at Trader Joes had milk and eggs in it, but I was hoping the WF would come through for me. Guess what? Just like the guy who stood me up on Valentines Day, my favorite grocery store fell through on me. So, I i-phoned a recipe for the bread. Unfortunately, I cannot find the original site where I found the recipe, so if you recognize the one I’ve posted below, please let me know so that I may properly attribute it. I probably should have written it down or bookmarked it, but in the heat of the moment I completely forgot myself. Dissolve yeast in warm water and allow it to sit for 10 minutes. Stir in sugar, soy milk, salt, and flour. Mix until it forms a ball in the center of the bowl. Turn out onto a floured surface and knead for about 10 minutes. Place into a clean bowl, cover with a cloth, and let it sit in a warm place until doubled in size (about 1 hour). Punch dough down and roll into 16 balls. Place on a plate or baking sheet and cover again. Let rise for 20 minutes. Brush a pan with olive oil and bring it to medium-high heat. Flatten each ball and drop into the pan. Cook until brown, brush the top with oil, and flip. Bring a pot of water to a boil. Drop in the broccoli for 3 minutes and then rinse with cold water. Separately, heat the olive oil in a frying pan and cook the ginger for a few minutes. Add broccoli, tomatoes, and red pepper. Cook for about 5 minutes, or until the water from the tomatoes starts to dissolve. Hey Everybody, I just wanted to let you know that my little blog is already up to 841 unique page views. So keep coming back, keep linking your friends, and most importantly, keep clicking on those ads to visit my wonderful advertisers. Sometimes, I like to do absolutely ridiculous things with my time. I specifically enjoy theme nights, as anyone who attended my Gray Gardens party or NYE ’007 style knows. This past weekend, I decided to spend a few hours putting together an Indian-themed dinner. I had a great recipe for Batata nu Shaak from a co-worker, who also thoughtfully presented me with a bunch of ziploc bags full of spices. For those of you who are not in the know, Batata nu Shaak is a potato dish with about 5 million different spices. This weekend was not only the first time I’ve ever made Indian food, it was also the first time that I’ve worked with such a complex flavor profile. I can’t believe that I managed to grow up without ever trying Indian food. Now, I eat it all the time. Most Indian recipes do not even need to be veganized, because they rely heavily on staples like potatoes, tomatoes, and chickpeas. I decided to round out my meal with vegan chana masala, whole wheat naan, and a broccoli and tomato side dish. I’ll post two of the recipes today and two tomorrow, because I need to come up with reasons to keep my public coming back. 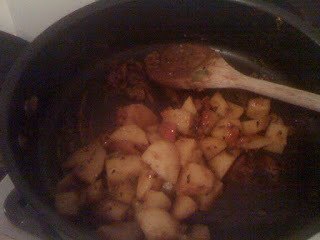 Heat the oil in a heavy-bottomed pan on medium head and add the mustard, cumin, and kalonji seeds. Let them cook for a few minutes until they start to crackle. Add the asafoetida, tumeric, and red chili powders. Add the chopped tomatoes and ginger and sautee until the tomatoes get soft and tender. Add coriander powder, cumin powder, garam masala, sugar, and salt. Mix well. Add potatoes and 2 cups of water and reduce heat to low, cooking for 20 minutes or until the potatoes are cooked and the gravy thickens. Saute onions and garlic in olive oil over medium-high heat for 2-3 minutes, or until soft. Stir in lemon juice and spices and simmer for 10-15 minutes or until liquid reduces. Take your spinach and roll it together until it looks like a fruit roll-up. Slice the roll into very thin slivers. Fluff it with your hand and marvel in your own culinary prowess. Reduce heat and add spinach. Cook for 5 minutes, or until spinach is just wilted.